Started with a hunt for an led-fiberoptic frisbee i saw in a store… ended with STROBE LED FOOTBAGS! and FRISBEES! Well those and the Jugglo Atom Ball which just made for a mesmerizing picture. There isn’t much more to say about them that the imagination can’t fathom on it’s own. The possibilities are endless. In the dark. All the colors. Flashing. (your choice fast or slow) and you can Throw it, Kick it, Bounce it. FUN. NightHACK for insomniacs like me. i still haven’t found the one i originally saw. You should ditch the fiber optics all together and get a really solid disc like the ones by Black Jax Sports. The fiber optics just dilute the light from the one LED in the center. The discs by Black Jax have 4 LEDs on the edge that make it super easy to see the rim when it’s in flight. The flashflights are just too dim to really enjoy, unless you like getting smacked in the face when you lose track of it!! 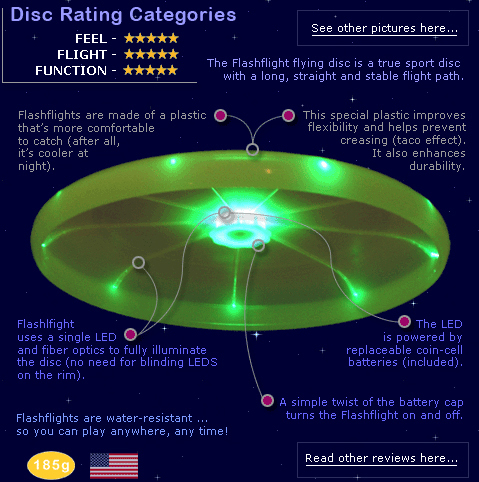 Check out the best light up flying discs I’ve found to date. Let me know when you track down the disc you were looking for. I have so many lighted discs and have never seen any that use fiber optics. That’s one of the claims in our patent, so I’d be curious. Thanks for the nice info about our disc. I’ll do my best to capture some images of the Disc-o an update the simulator. That would be cool!